Wallace, Sarah Isabel. "Williams Treaties". The Canadian Encyclopedia, 06 November 2018, Historica Canada. https://www.thecanadianencyclopedia.ca/en/article/williams-treaties. Accessed 19 April 2019. The Williams Treaties were signed in October and November 1923 by the governments of Canada and Ontario and by seven First Nations of the Chippewa of Lake Simcoe and the Mississauga of the north shore of Lake Ontario. As the last historic land cession treaties in Canada, these agreements transferred over 20,000 km2 of land in southcentral Ontario to the Crown; in exchange, Indigenous signatories received one-time cash payments. While Chippewa and Mississauga peoples argue that the Williams Treaties also guaranteed their right to hunt and fish on the territory, the federal and provincial governments have interpreted the treaty differently, resulting in legal disputes and ongoing negotiations between the three parties about land rights. In 1763, the Royal Proclamation converted some of the former lands of New France into large areas of territory over which the Indigenous occupants held title. By the time of the American Revolution (1775–83), this territory had significantly decreased in size, as colonial wars and white settlement pushed Indigenous peoples off their lands. Traditional territory was further reduced after the American Revolution, when the Crown looked to accommodate approximately 30,000–50,000 Loyalists fleeing an independent USA. Moreover, after the war, the Americans disregarded Britain’s Royal Proclamation, contributing to the reduction of Indigenous lands. In order to gain title to Indigenous land, Britain negotiated a series of treaties — known as the Upper Canada land surrenders — with the Mississauga, Chippewa and other First Nations residing near the St. Lawrence River and lower Great Lakes. (See also Ojibwe.) Between 1781 and 1812, these land surrenders transferred ownership to the Crown in exchange for one-time payments and in some cases, hunting and fishing rights. Surrenders that occurred after 1818 were compensated with annuities (annual payments). 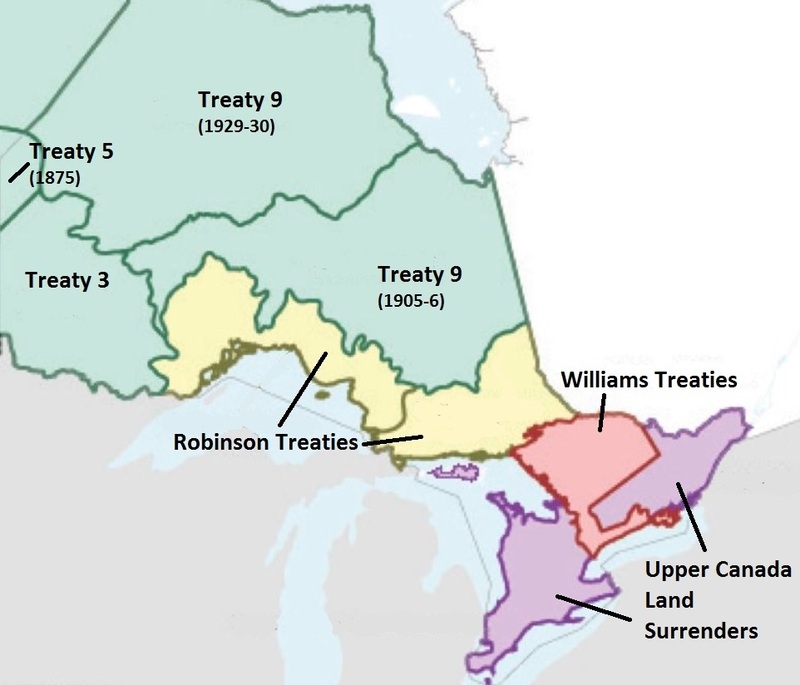 The Robinson-Huron and Robinson-Superior treaties of 1850 ceded Indigenous lands around Lake Superior and Lake Huron in what is now southern Ontario to the Crown for land rights and annuities. The Robinson Treaties became the template for many post-1850 treaties between First Nations and colonial governments. Treaties 3, 5 and 9 of the Numbered Treaties cover northern and western Ontario. They generally provided more hunting and fishing rights than previous treaties and followed an annuity model. By way of these treaties, the Crown had gained title to most of Ontario by the early 20th century. However, much of the land in the upper Ottawa River and Muskoka regions had not been surrendered. This was problematic because the Ontario government was already using that land for white settlement but without the relinquishment of Indigenous title. Lack of a treaty meant that the Chippewa and Mississauga inhabitants were not receiving anything in exchange for the use of their land, such as financial compensation or the guarantee of land rights. Indigenous calls for redress eventually resulted in a federal investigation. Appointed by the minister of justice in 1916, Robert V. Sinclair began to investigate these matters. He confirmed that there were in fact many problems with the treaties’ allotment of lands and that not all lands had been fully ceded. In 1923, the governments of Ontario and Canada appointed a three-man commission — known as the Williams Commission — to further investigate. It consisted of Robert V. Sinclair (the commission’s federal negotiator), Uriah McFadden (a lawyer) and Angus S. Williams (the provincial negotiator). The commission’s ensuing report affirmed Indigenous historic claims to large tracts of land in central and southern Ontario. Consequently, in 1923 the commissioners brokered two new treaties — known as the Williams Treaties — to extinguish Chippewa and Mississauga title to the lands in question. No negotiations preceded the signing of the Williams Treaties in 1923. Instead, government officials dictated the terms that Canada and Ontario had decided earlier that year to the First Nations signatories. The reason for the governments’ haste may have had to do with the fact that Ontario was already using most of the territory in question, and therefore, officials were highly motivated to extinguish all remaining title to it. Historian Peggy J. Blair adds that First Nations peoples may have been ready to take their grievances to the League of Nations and to British officials in London, England in that same year, perhaps prompting the federal government to move quickly with the treaties. Federal representatives signed the first Williams treaty between 31 October and 7 November 1923 with the Chippewa peoples of Rama, Christian Island and Georgina Island in the Lake Simcoe area. The second treaty, essentially identical to the first, was signed by the Mississauga peoples of Alderville, Scugog Lake, Mud Lake and Rice Lake between 15 and 21 November 1923. Signings occurred on band territory. By signing the treaties, the Crown received three tracts of land: the first lay between the Etobicoke and Trent Rivers and was framed by Lake Ontario’s northern shore, the second expanded north from the first to Lake Simcoe. Together, these tracts made up roughly 6,475 km2. The third tract of land measured 45,584 km2 and lay between the Ottawa River and Lake Huron. In exchange, the Mississauga and Chippewa peoples received a one-time payment of $25 for each band member. The Mississauga also received $233,425, while the Chippewa received $233,375 (both were one-time payments). This money made up a fraction of their land’s estimated value. When compared to the Upper Canada land surrenders and Numbered Treaties, the Williams Treaties provided less favourable terms for the First Nations signatories. The Chippewa and Mississauga peoples, who had no legal representation at the treaty talks, received modest lump sum payments for large sections of land instead of annuity payments distributed in perpetuity. The Williams Treaties also surrendered hunting and fishing rights to off-reserve lands — a significant departure from what had become common practice in the Robinson Treaties and Numbered Treaties. There are various reasons as to why the Williams Treaties look different than other land cessions. In addition to the government’s hastiness with the treaty proceedings, historian Peggy J. Sinclair argues that after the mid-1800s, the Ontario government, keen on facilitating white settlement, may have purposefully excluded certain Indigenous rights from the written text of the Williams Treaties. The signatories may not have realized that they were relinquishing these rights because in historic treaties they were usually retained. Land use rights in the territory covered by the Williams Treaties has been the subject of 20th- and 21st-century legal disputes between the descendants of Indigenous signatories and the federal and provincial governments. The First Nations peoples who live in Treaty 20 — an area of land that overlaps the Williams Treaties, including modern-day Peterborough and parts of Kawartha Lakes and Durham — argue that the agreement they signed in 1818 (known as the Rice Lake Purchase) guaranteed their right to hunt and fish. In the 1981 case of R. v. Taylor and Williams, the Ontario Court of Appeal ruled that Treaty 20 did, in fact, guarantee those rights. In 1985, George Henry Howard, a member of the Hiawatha First Nation (Mississauga) of Rice Lake, was charged with fishing out of season on the Otonabee River. Howard argued that his fishing rights were protected by the Williams Treaties. The Ontario Court of Appeal, however, found that federal fishing laws had extinguished any rights to fishing outside of reserves. After this defeat, the Hiawatha First Nation and other First Nations in the lands of the Williams Treaties entered into agreements with the Ontario government that provided for limited harvesting rights, including the Community Conservation Harvest Agreement (signed with the New Democratic Party in 1995) and the Aboriginal Communal Fishing License (developed in conjunction with the federal government). However, these agreements were short-lived; the government of Premier Mike Harris cancelled them later that year. In 1992, the seven Williams Treaties First Nations filed a lawsuit against the federal government — Alderville Indian Band et al v. Her Majesty the Queen et al — seeking financial compensation for the 1923 land surrenders and harvesting rights. In May 2012, the trial entered the first stage in which profile witnesses, chosen by the community, testified on behalf of their community to the court. Stage two began on 29 October 2012 and involved the testimony of experts in subjects involving treaties and Canadian history. Based on the evidence presented, Canada and Ontario acknowledged limited off-reserve treaty harvesting rights, specifically in the Treaty 20 area, as well as other regions covered by certain pre-Confederation treaties. In 2016–7, the parties discussed ways to negotiate a settlement outside of the courts, and litigation was dropped in favour of ongoing negotiations. In March 2017, the Ontario government announced that the province, the federal government and the seven Williams Treaties First Nations had begun formal talks to resolve the issues identified in the Alderville litigation. Robert J. Surtees, “The Williams Treaties: Research Report,” Treaties and Historical Research Centre, Indigenous and Northern Affairs Canada (1986). Robert J. Surtees, « Rapport de recherche sur les traités Williams (1923) », Centre de la recherche historique et de l’étude des traités, Affaires autochtones et du Nord Canada(1986). Peggy J. Blair, Lament for a First Nation: The Williams Treaties of Southern Ontario (2009). John Borrows et Michael Coyle, éd., The Right Relationship: Reimagining the Implementation of Historical Treaties (2017). John Borrows and Michael Coyle, eds., The Right Relationship: Reimagining the Implementation of Historical Treaties (2017). FIRST WILLIAMS TREATY The federal government provides a copy of the treaty made on 31 October 1923 between his Majesty the King and the Chippewa of Christian Island, Georgina Island and Rama. SECOND WILLIAMS TREATY The federal government provides a copy of the treaty made 15 November 1923 between his Majesty the King and the Mississauga of Rice Lake, Mud Lake, Scugog Lake and Alderville. PREMIER TRAITÉ WILLIAMSLe gouvernement fédéral fournit une copie du traité conclu le 31 octobre 1923, entre sa Majesté le Roi et les chippaouais des îles Christian et Georgina, et de Rama. LITIGE D’ALDERVILLELe gouvernement de l’Ontario fournit des renseignements sur les négociations avec les Premières nations des traités Williams concernant les droits de récolte. DEUXIÈME TRAITÉ WILLIAMSLe gouvernement fédéral fournit une copie du traité conclu le 15 novembre 1923, entre Sa Majesté le Roi et les mississaugas d’Alderville et des lacs Rice, Mud et Scugog. WILLIAMS TREATIES FIRST NATIONS The official website of the seven First Nations of the Williams Treaties. TREATY RESEARCH REPORT Read historian Robert J. Surtees’s overview of the Williams Treaties. RAPPORT DE RECHERCHE SUR LES TRAITÉSLisez l’aperçu des traités Williams de l’historien Robert J. Surtees. PREMIÈRES NATIONS DES TRAITÉS WILLIAMS Site officiel des sept Premières nations des traités Williams. THE HOWARD CASE Read the details of the case and the Supreme Court of Canada’s judgement. L’AFFAIRE HOWARDLisez les détails de l’affaire et le jugement de la Cour suprême du Canada. ALDERVILLE LITIGATION The Ontario government provides information about negotiations with the Williams Treaties First Nations over harvesting rights.